Saudi Arabia’s Commission for the Promotion of Virtue and Prevention of Vice has asked the interior ministry to arrest several people for apostasy and atheism. The commission did not divulge the number of people whose arrest it requested, but it said that they insulted God and Prophet Mohammad (PBUH). In 13 countries around the world, all of them Muslim, people who openly espouse atheism or reject the official state religion of Islam face execution under the law, according to a detailed study issued on Tuesday. And beyond the Islamic nations, even some of the West's apparently most democratic governments at best discriminate against citizens who have no belief in a god and at worst can jail them for offenses dubbed blasphemy, it said. Israeli police on Sunday blocked more than 200 far-right Israeli protesters from rushing guests at a wedding of a Jewish woman and Muslim man as they shouted "death to the Arabs" in a sign of tensions stoked by the Gaza war. There really is very little sport in finding examples of religious persecution around the world, but not in the U.S. What you will find in the U.S. is a fair number of bigots whining about the decline of bigotry in polite society. You'll also find people who think the earth is flat. Some people are impervious to reason. 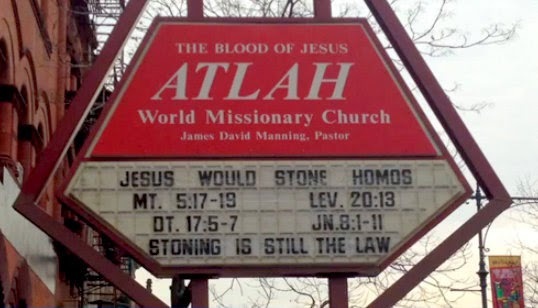 I'm afraid James Manning hasn't finished the book yet - stoning is against the Law, as Jesus taught. Unsurprisingly, not one of your claims of persecution has stood up to even a tiny bit of scrutiny. How many times do I have to debunk you before you start to take seriously the possibility that you might actually be wrong about this?